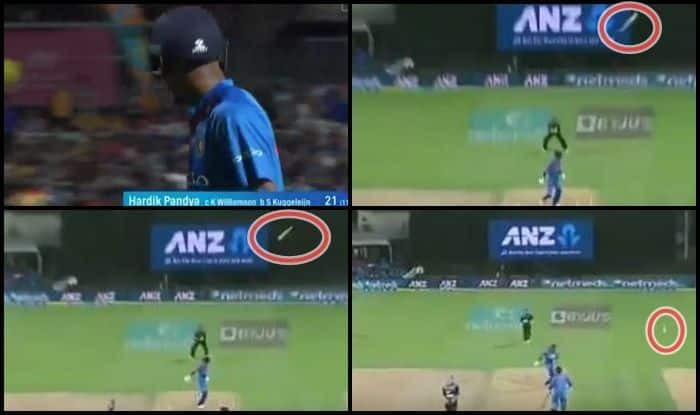 3rd T20I India vs New Zealand: Just when Hardik Pandya looked in the mood to take India home in a big chase, he lost his wicket trying to hit the ball out of the park. 3rd T20I India vs New Zealand: Just when Hardik Pandya looked in the mood to take India home in a big chase, he lost his wicket trying to hit the ball out of the park. He lost his shape and his bat as the ball lobbed up in the air, only for Kane Williamson to come around from covers and complete the catch during the series decider at Hamilton. Pandya departed for a breezy 11-ball 21. His cameo was laced with two sixes and a solitary boundary. Pandya seemed to be the last hope for India and once he departed the writing seemed to be on the wall. Chasing 213, India is 76/1 in eight overs. Earlier in the day, Rohit Sharma won the toss and opted to bowl first on a batting paradise at Seddan Park. Kuldeep has been the pick of the bowlers as he scalped two wickets for 26 runs in his stipulated four overs. Dhoni affected a lightning-quick stumping to send Seifert packing. Meanwhile, MS Dhoni, who was playing his 300th T20 match did have a great day behind the stumps but failed with the bat as he could only score two off four balls.